Here’s a review of a hotel that will close next week for two years. Consider this the “before” review in preparation for the “after” review in late 2019. But even the old Park Hyatt Toronto is, well…was still a great property. The hotel is in Yorkville, a posh Toronto neighborhood with incredible architecture, restaurants, and stores. An old Anglican Church sits across the street from the hotel. Arriving around 1pm, I was granted an early check-in and upgraded to a suite in the old wing of the hotel. I’ll admit it: the hotel does feel dated. Like a fine hotel…from the 1990’s. And that’s what it was. Hyatt bought the hotel in 1999 from Four Seasons, allegedly paying the highest cost per hotel room ever paid in Canada. I thought my room was perfectly fine. Paint was chipped a bit in certain areas, but the tile in the bathroom and was well-maintained and everything looked nice. Dated, but nice. The living room contained a couch, chair, and desk while the bedroom contained a snugly fit bed. An illy coffee machine along with a poorly-stocked mini-bar was available. Construction outside did not create much noise, but did not make the for the most beautiful views. The bathroom contained a shower/bathtub combo and separate toilet. Some rooms have already been renovated – check out One Mile at a Time’s review for what the new room will look like. After the arduous journey to Toronto, I enjoyed a beautiful afternoon nap before my evening appointment. I understand the hotel once had one of the best spas in the city. That has already closed, as has the fitness center. But the hotel turned what appeared to be a retail store along Avenue Rd with a temporary fitness center. It did the job. Breakfast, served in Annona,was tremendous. 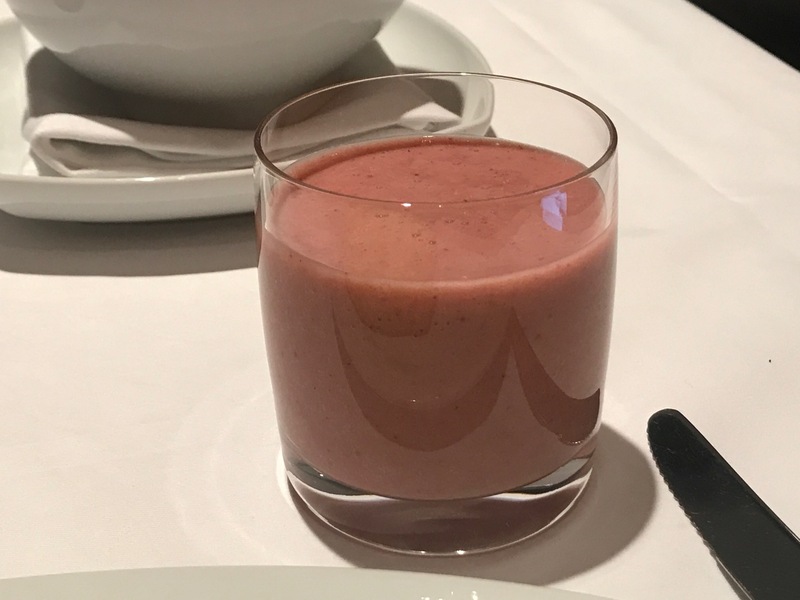 I appreciated the simple a la carte menu and enjoyed freshly-squeezed orange juice, a berry smoothie, cappuccino, fresh berries, and a cheese and bacon omelet with asparagus. A filling, delicious, moderately healthy breakfast. A few days later, I noticed that breakfast had posted to my credit card. That annoyed me, because even at check-out the associate mentioned that breakfast was waived due to my Globalist status. But a Hyatt customer service rep was able to promptly reverse the charge. I cannot wait to see what the Park Hyatt does with its Toronto property. We’ll have to be patient since the hotel is not expected to re-open until late 2019. I never checked out the hotel’s rooftop bar, but I hear it is one of the best bars in Toronto. You still have five more days to check that out if you happen to be in town. Next Article Airport Shuttles are NOT the Bane of My Existence! There’s no dollar limit for breakfast at PH Toronto? When I was there a few years ago, there was a limit of about$25 pp. That’s cheap. Perhaps that is why the whole charge showed up, but I was never given any dollar limit at check-in or in the restaurant. In fact, the only “strict” limit I’ve ever encountered was at the Park Hyatt New York. Yea, maybe that’s why your charge showed up. I remember juice refills weren’t included either. The $25 was just enough for one of the breakfast options – I can’t remember which. Service was nonexistent. I used a DSU too at the time, but my suite layout was different from yours. I love the HR TO, very convenient when flying Porter and walking to lots of good eats. That said, I’m looking forward to giving the PH TO another chance after they’re done with the renovation. I just completed my 12th stay at this property in early November. I love this Hotel, and the staff treats me very well. I am going to miss it next year, as I’ve already got 2 more trips to YYZ on the books. Going to have to low-brow it at the Regency downtown…(the Hyatt Place Mississauga may be open by the end of ’18, but we’ll see). In speaking with Director Of Rooms during my stay, apparently the renovations shown in the OMAAT review (I’ve also stayed in that renovated room) have been scrapped; the final result (to be unveiled two years hence) will be different. I’ll be a top-to-bottom renovation, and thus will likely be moving up from it’s current CAT 4. I would guess that it’ll become a CAT 6, not unlike the PH Washington D.C.
Of course, it’s very likely that we’ll see a shake-up (read: devaluation) across all Categories before the end of 2019, with the introduction of additional CATs (i.e. 8 & 9) and the slide upward of current CAT 7’s into the CAT 9 territory, etc. The free breakfast is usually the Prix Fixe amount (max $26 last I saw), but they have always been very generous for a la carte choices and latte as your coffee, as well as in-room service, never been charged more in the 20+ stays, unless I had additional people than were permitted. As noted, the model suites would not be the ones featured, though the model 1BR suite was stunning with a dark black/grey motif and a huge bathroom that included a soaker tub and massive walk-in shower. IN addition, the South tower (which faced downtown and had the much nicer views will be the residence (rooftop bar is hopefully going to reopen as it is a great bar for drinks! ), while the North tower will be the hotel. They are also expanding the promenade that connects the 2 towers by adding a second floor for venue space.